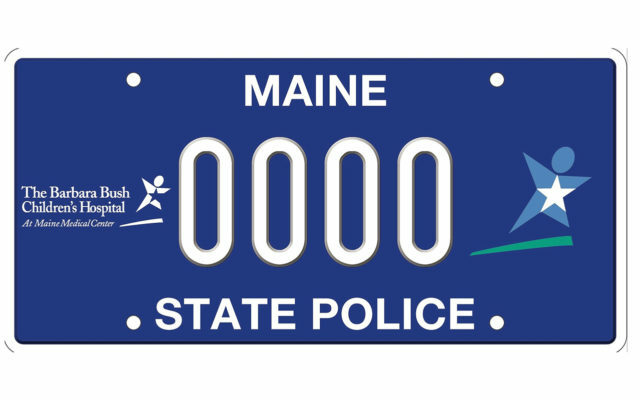 The Maine State Police have issued commemorative license plates for their fleet that honor the Barbara Bush Children’s Hospital in Portland. AUGUSTA, Maine — The Maine State Police have issued commemorative license plates for their fleet that honor the Barbara Bush Children’s Hospital in Portland. The license plates will be attached to State Police cruisers until the end of September. The plates will then be signed by the individual troopers and collected to be sold via online auction and at other special events to benefit the Children’s Hospital. It is the fifth time State Police have issued special plates to benefit nonprofit organizations. Past recipients have been Breast Cancer Awareness, Wreaths Across America, Special Olympics and the Travis Mills Foundation. The previous commemorative plates have raised between $15,000 and $20,000 for each of the organizations. The commemorative plates are a collaborative effort with the Maine State Troopers Association and the Maine Troopers Foundation. The plates began appearing on State Police vehicles Sept. 2 and will be displayed until the end of the month. September is National Childhood Cancer Awareness Month. The Chief of the Maine State Police, Colonel John Cote, said the Barbara Bush Children’s Hospital and State Police have had a long association. Troopers have brought presents in for patients at the hospital annually at Christmas for several years.